degrees of proficiency depending on the individual. The program is aimed at developing skills in all three languages, providing educational activities for the youths, and fostering a greater understanding and appreciation of the Mixtec cultural heritage. In addition, the organization serves as a support network for new immigrant families. The Youth Mentoring Program focuses on helping to mentor youths at Access with college-bound tutoring, discussions or presentations on bullying or other issues, identifying scholarships and other resources, and other efforts dedicated to supporting the youths and building education pathways. 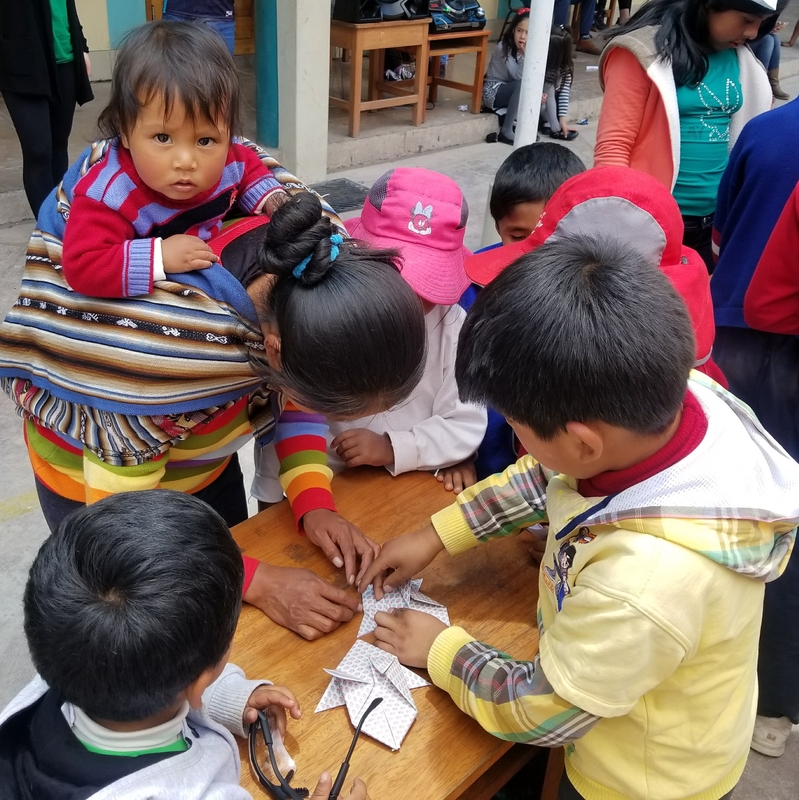 University of San Diego students in a Mathematical Explorations class in Peru collaborate with Peruvian volunteers through Proyecto Mochila: http://www.umbrellainitiatives.org/?page_id=63 and elementary schools in the Cusco, Peru area to provide a week of enrichment activities, active learning experiences and school supplies to children in underserved areas. Three different USD student groups have participated in this experience: January 2017, January 2018, and January 2019. “Paper Machines Workshop” was a fun and interactive workshop that introduced families to design thinking techniques used by industry experts and the endless possibilities between engineering and paper folding concepts. Participants learned various techniques and how to combine them to create their own paper machine to take home. This event was organized by Dr. Odesma Dalrymple, Industrial and Systems Engineering, Shiley-Marcos School of Engineering and Dr. Perla Myers, Mathematics Department, College of Arts and Sciences, as part of the 52 Weeks of Science in Clairemont and the San Diego Festival of Science and Engineering. 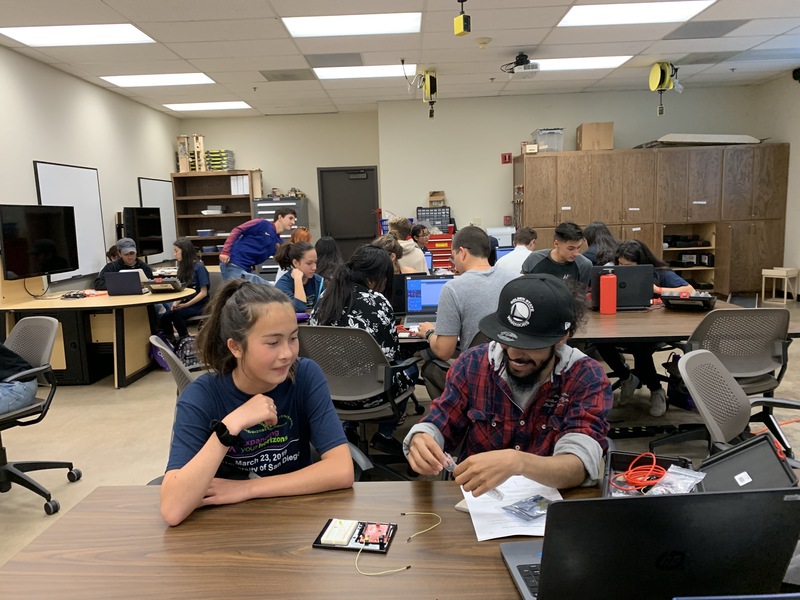 This collaboration between Carson Elementary STEAM Magnet School and University of San Diego's Innovate Living Learning Community took place in November 2018. The event began with a pupusa dinner for Carson's families and staff and USD's students together with estimation activities and a welcome to the event by the school principal, Ms. Courtney Young, and the student body president. Then students and faculty worked with the families on hands-on, interactive sessions including explorations in engineering, chemistry, Asian food and culture, mathematics, and biology. The College of Arts and Sciences, the School of Leadership and Education Sciences and the Shiley Marcos School of Engineering, in collaboration with the Chula Vista School district is designing, developing, implementing, and testing a multilayered Science, Technology, Engineering and Mathematics (STEM) learning approach specific to STEM learning and workforce development in STEM targeting Hispanic youth. The STEM World of Work project explores youth STEM identity through three mechanisms: (1) an assessment of their individual interests, strengths, and values, (2) exposure to an array of viable STEM careers, and (3) engagement in rigorous hands-on STEM activities. The project centers on a youth summer STEM enrichment program and a series of follow-up booster sessions delivered during the academic year in informal contexts to promote family engagement. The University of San Diego has been hosting an annual day-long summer STEAM Youth and Community Conference since 2016. The goal is to bring students, families, educators and leaders together to provide new pathways for youth to ignite, develop and pursue their STEAM interests, while simultaneously elevating the STEAM literacy, awareness and nurturing potential of the community. Attendance is free and open to all members of the community. Conference activities consist of engaging and inspiring workshops and presentations from STEAM professionals and leaders, as well as interactive STEAM workshops and games hosted by students and educators. Additionally, the students from the STEAM Academy share their projects with the conference attendees. In 2016, the conference took place on Saturday, August 13 from 9:00am-3:00pm. There were 23 workshops/presentations/panels and and a keynote speaker, Melinda Graham, from Oracle. Approximately 200 people from the community attended. 1. ROK’n Robots – This open-ended robotics play is a creative activity for ages 3+. Use snap-together Rokenbok construction pieces and motors to build a robot on a motorized chassis. Bring your creation to life with an easy-to-use Rokenbok remote control. 2. Robotic Lifting Crane Challenge – Teams of four participants ages 9+ start with a lesson about using pulleys to lift heavy objects. Use this knowledge to build a robotic lifting crane using construction pieces and motors while staying within certain parameters (specifications, budget, deadline) just like a real engineering project. 3. Autonomous Robotics Challenge – Participants ages 12+ will automate a robotic machine that moves nuclear fuel. Add sensors and write the code to ensure your robot does its job with precision and reliability. Easy-to-use graphical block coding and snap-on sensors make this a great challenge for both beginning and experienced roboticists. Expanding Your Horizons is STEM conference for girls in grades 6-10, connecting 350-450 girls from across San Diego County with STEM professionals in the San Diego community. Groups of 12-15 girls are mentored by 2-3 female STEM undergraduate students, providing the girls with additional STEM-based interactions, as they participate in a day of STEM activities on the USD campus including three hands on workshops. The community goal is to increase the girls’ interest in STEM careers by providing exciting and engaging hands-on learning experiences. At least half of participants are provided busses from their local schools across the county to campus to enable students from all communities to participate. In this activity, 24 undergraduate students served as co-presenters in three separate sessions of a workshop, individually working one-on-one with participants to enable them to succeed in an activity that was derived from a hands-on circuit/programming experience that the undergraduate students themselves had completed. The workshop description: "Combine circuit building and electricity in a hands-on project to build a multicolored night-light that uses a program for an Arduino. Using a programmed Arduino, light-emitting diodes (LEDs), resistors, and sensors can make devices like a multicolored night light." This workshop was one of approximately 27 different professional STEM led handson workshops offered on the day of the conference. 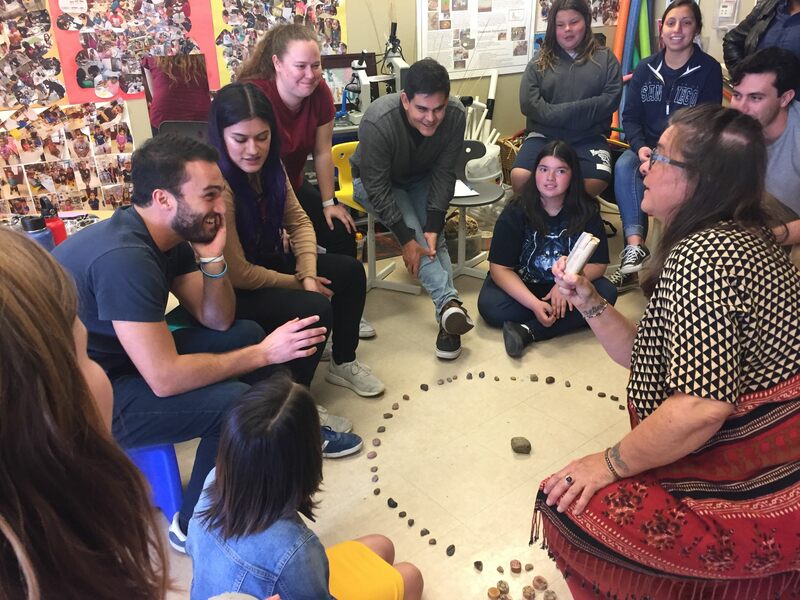 For many years, University of San Diego faculty and students have engaged in meaningful work locally, whether it was volunteering or developing service-learning courses working closely with the Mulvaney Center or Changemaker Hub on campus. The work of organizations such as University Ministry with the Romero Immersion Programs, Justice in Mexico or the Trans-border Institute in the Kroc School, which helps to build sustainable peace in Mexico and the border region, are great examples of how we can effectively leverage our position near an international border. We must intentionally strengthen and deepen our partnership network and join communities as we work to enhance USD’s role in the community. This will manifest in many ways since opportunities exist for USD to be more engaged locally in improving K-12 education, enhancing economic development, promoting health care, and serving as a catalyst for community development. This work will help USD emerge as the leading faith-based, anchor university in the United States. In order to set the standard for an engaged, contemporary Catholic university in 2024, we must be a great local university confronting the urgent challenges of our community.